It's the first day of spring in the Northern Hemisphere! Yay! I still haven't uploaded my neighborhood bloom pics but it looks like I'm going to be able to get many more this weekend because the sun is shining and the days are longer. The U.S. is finally getting in on the children's books in cereal boxes racket thanks to Cheerios. 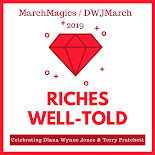 Jacket Copy doesn't give a date for when this will start but the books are by first-time authors and they are chosen through a contest. io9 says that there is going to be a new A Wrinkle in Time movie. That's good news because the first one was rather bad. Atlas Obscura is one of my favorite new sites and the other day they featured a rabbit carving that may have influenced a young Charles Dodgson to write about a certain white rabbit. What do you think? 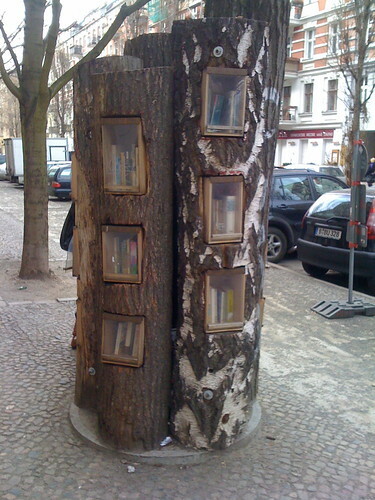 Rob of RobAround Books has a Bookshelf of the Week feature and this week's photo from Joseph del Pesco is unique -- a hollow tree structure on the streets of Berlin with books inside. Thanks for the heads-up on Life. I'll have to record it. We have every episode of "Planet Earth" recorded and go through phases of watching it. Great great stuff. We have the first two Life episodes recorded now but haven't watched them yet. I want to save them for a time when I can pay attention and not just have them on in the background! Planet Earth was awesome!